Review: "Electrotype: 7.50" - Sea of Tranquility - The Web Destination for Progressive Music! Electrotype is an independent art/prog rock artist based out of the Philadelphia, PA area. 7.50 is the debut EP released on 11/11/11. Beth Maplesden is Electrotype. She sings all vocals, plays the guitars, bass, keyboards, drums and performs all percussion sequencing. The album name was conceptualized from the fact that there are what Beth considers seven and a half tracks. 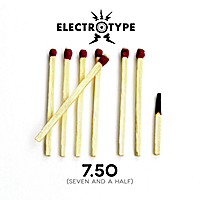 The creation of Electrotype and 7.5 took seven and a half years from conceptualization until the album was released. Beth defines the impetus for recording the album as a job loss back in 2008 that caused Beth to take the plunge and finally create the album she had been considering for years. Now despite this album being performed by one musician, do not get the wrong impression. The opening track "Both Sides of the Atlantic" has enough sonic power to rock a stadium. This lady can rock the walls. The electronics, keyboards, power driving lead electric guitar and chunky bass will�well�surprise you. This track is all instruments unleashed, and Beth gives any doubters a good reason to stop worrying. "Pound of Flesh" is full of Beth's first vocals on the album. I can't think of another female singer to compare her to, so I will agree with her site as she describes her sound like a "Radiohead-style vocals/melody/lyrics over a Blondie-like organ/guitar/bass/drums combo". Yes. It sounds great. "How Many" is a fast, 34 seconds fast bluesy rocker that passes much too quickly. "Clockwork" is another fast opener and closer at only 1:37. But Beth gives you a full dose of keyboards, drums and deep bass for the duration. "Hard to Believe" uses excellent piano keyboards at the opening to gain your attention. Beth sings slowly as she plays drums and a combination of keys. "Invisible Shadows" is a cool experiment with dissonance range. Electric guitar ripped in all manner of ways with some stellar riffs. At 5:24, it is the longest song and full of muscle. Probably the best track on the album for any Jimmy Page guitar experimentation fans out there. Enjoy the ride while it lasts. Nice. "Night Visions/In the Blink of an Eye" opens with deep keys and moody keyboard playing that will surely surprise even the most jaded rock fan. The dose of metal-flavored rock in the second half of the track will rock and climb your walls with heavy electric lead guitar dissonance. Cool. "Ready" sounds like a Blondie song at the opening but spills into a keyboard extravaganza full of sonic power and combustibles. Electrotype' s 7.5 was an interesting promo to receive. Definitely not something I hear every day, which makes it special. If you want something new that doesn't fit neatly into any particular category this is the ticket.